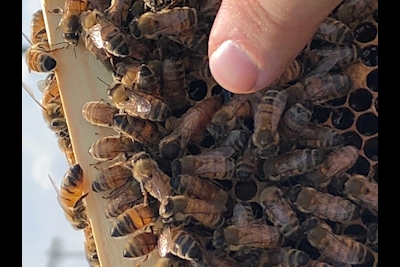 Today Delta people near and far have spoken, declaring the names of their new honey bee queens — recently unveiled, along with their hives, at the airline’s headquarters in Atlanta. This is in connection with Delta’s newest local sustainability effort with the help of eco-friendly startup Bee Downtown. For the last three weeks, employees throughout Delta’s system have been able to engage in its corporate initiative by participating in a fun name campaign to submit creative ideas worthy of royal honey bee status. Over 4,000 initial submissions were made consisting of a variety of thoughtful (‘Deltabeena’), clever (‘Wasabee’) and humorous or nonsensical (‘Bob’) potential monikers. A small team of worker bees ‘combed’ the list to find a combination of the most popular names along with those that would best represent Delta’s history and strong culture. Narrowing the list to 70, and again to 15, the final names were divided into three categories, Delta Culture, Pop Culture, and Bee Culture to capture the scope of submissions.